Israel has been making headlines around the world lately, but not for the right reasons. Most notably, the 62-year-old country has been losing support from the United States under the Obama administration. Undeniably the most left-wing president in my lifetime, Obama is standing up for the wrong party. For some reason, the media can't wrap their head around other countries' war crimes, yet they incessantly call out Israel as it tries hard to defend itself against enemies. As the smallest and only democratic country in the Middle East, why can't Israel ever catch a break? 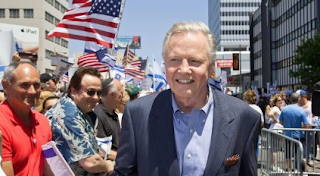 Obama may not be lending Israel his support, but another famous American is. Jon Voight, actor and father of Angelina Jolie, penned an open letter to the president. You will be the first American president that lied to the Jewish people, and the American people as well, when you said that you would defend Israel, the only Democratic state in the Middle East, against all their enemies. You have done just the opposite. You have propagandized Israel, until they look like they are everyone's enemy - and it has resonated throughout the world. You are putting Israel in harm's way, and you have promoted anti-Semitism throughout the world. Thank you, Jon, for sticking up for Israel when the rest of the world will not.